I will use the R package CausalImpact developed by Google to quantify the uplift in demand for KeepCups after the episode went to air. 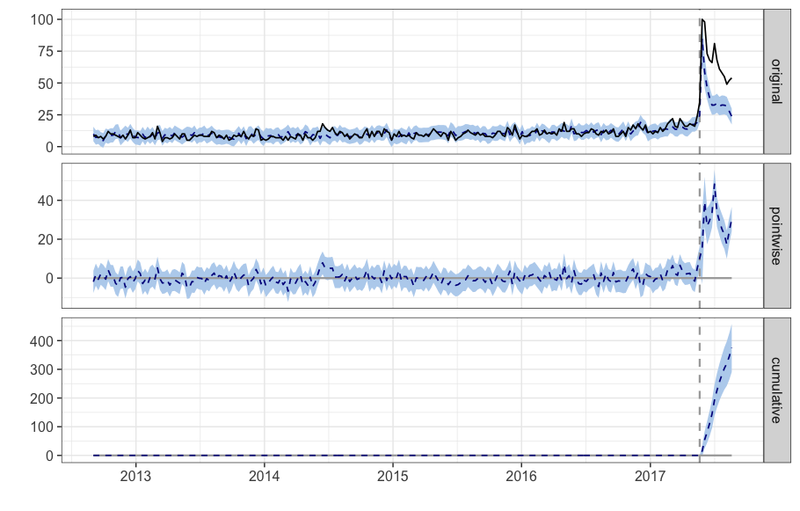 The code uses Bayesian structural time-series to build an estimate of what the search trends would look like if the documentary never happened, and then compares that with what actually happened. I will use weekly search index data from Google Trends as a proxy for demand as search trends data is usually highly correlated with sales of a product. Since 2012 the term “KeepCup” has been considerably more popular than “Reusable Coffee Cup” with a small upward trend since January 2016. The data prior to May 2017 serves as a baseline for the analysis and the generic term “Reusable Coffee Cup” is used to control for the overall interest and demand for reusable cups. # (pre-intervention period) and which period for computing a counterfactual prediction (post-intervention period). # would like to capture all search activity that occurred right after the episode went to air. 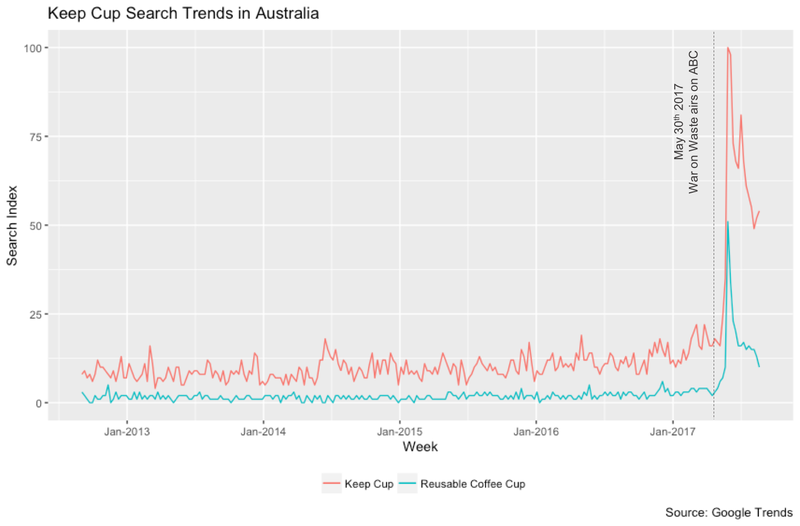 The results point to a significant uplift in search queries for “KeepCup” above and beyond the volume of search queries for “Reusable Coffee Cup”. Putting into numbers, the expected search index for “KeepCup” in the absence of any documentary would be 39. However, the actual index measured after May 30th was 68, a whopping 74% increase! KeepCup achieved a 74% increase in demand (search queries) with no spend in media and advertising. Note: since the metric used here is an index, it doesn’t make sense to report cumulative results. If the metric analysed was unit sales or dollars we could get a total cumulative benefit. Code and data can be found in this Github repo.